Cinnamomum burmannii, native to Indonesia, is an evergreen that grows 40-70' tall,with thick, leathery leaves up to 7" in length, and yellow flowers during the summer months. Unlike ceylon cinnamon, these sticks are made from outer tree bark, which is dried in quills and have a much more rigid texture and darker color the ceylon sticks. 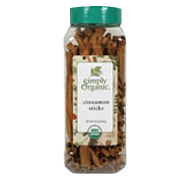 Simply Organic Cinnamon Sticks 2.75" is shipped in a discrete, unmarked package. Orders are processed immediately and usually take about 3 to 5 working days to be received. We do ask that you try it for 2 to 3 weeks to feel the full effects. Any information received is used only for order processing and shipping purposes. Your information, such as e-mail address, will never be disclosed to a third party.